This comforting 5 ingredient cheesy beef and egg noodle casserole recipe will become a staple at the family dinner table. Can we talk about these last few weeks? They have been really tough! There has been an insane amount of work that needs to get done, and just not enough hours in the day. I’ve literally been going to bed late and waking up early to get at least a little bit of work done, because I just can’t/won’t do work when I’m spending time with Ben after work when I get to see him and then do dinner time and bed time. But when he gets to bed, then the work needs to happen. I do feel like I’m being super productive when I’m working (either day job – running a small natural products manufacturing business – I shared more about it when I shared this 5-ingredient rigatoni with eggplant and chorizo or when I’m working on the blog business side of things) but it’s just sheer volume of work. 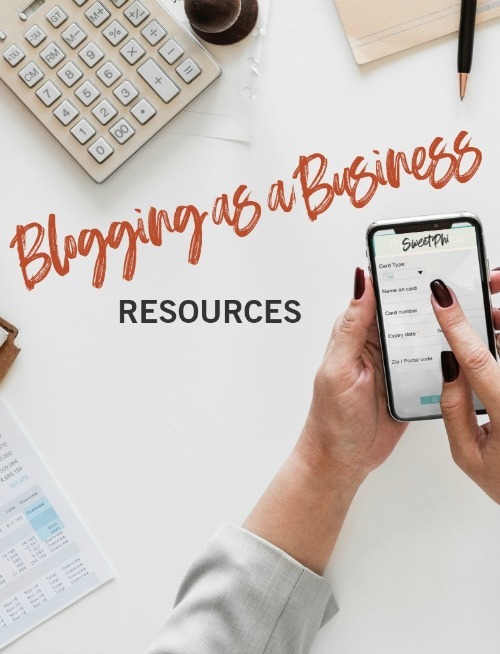 I know it all ebbs and flows, and this is just one of those times that I have to put in a little extra work and then it will all go back to being a more manageable amount of work soon. AND – the best thing I have to share with you guys? 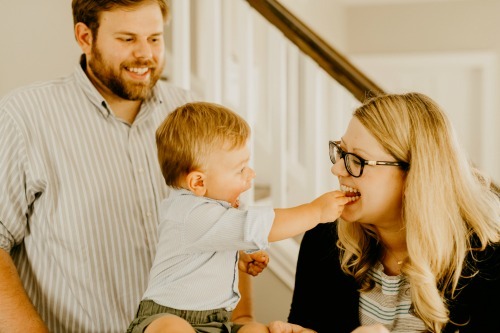 Ben said his first word, and it was MOM … and I caught it on video. Life = made! You can see it on my instagram stories highlight! Back to the recipe…as you may have gathered from the post on buffalo cauliflower nuggets…I love asking people what they make for dinner. 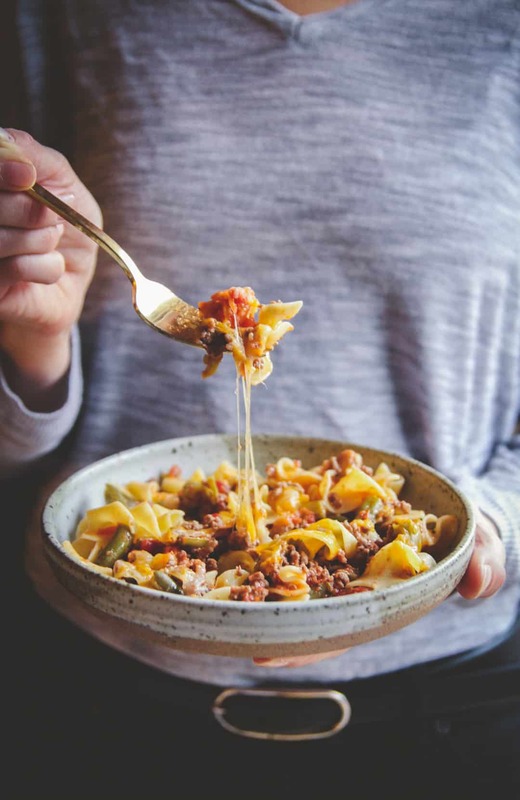 This cheesy beef and egg noodle casserole concept was shared to me by a fellow mom. 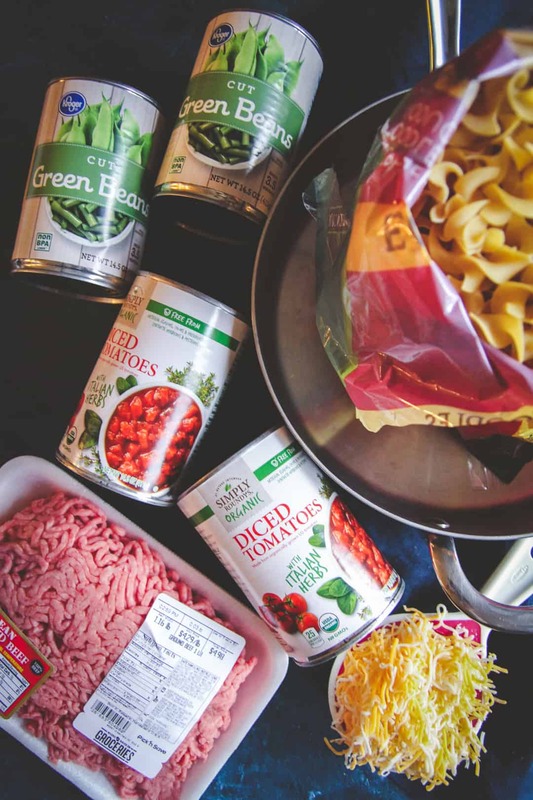 She said that while it may sound weird, the ingredient combination of beef, cheese, diced tomatoes, green beans and egg noodles was amazing and that her kids loved it. 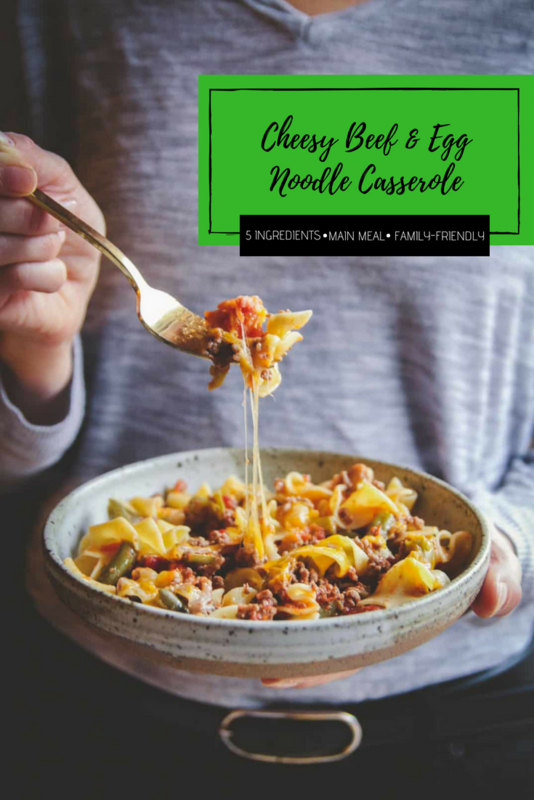 I made this 5 ingredient cheesy beef and egg noodle casserole and have to admit that while making it I was a little skeptical…but seriously, it was SO good and I’ve seen made this casserole recipe a bunch of times, and everyone that has it LOVES it! Cook noodles according to package instructions, then set aside. I like boiling them in salted water. 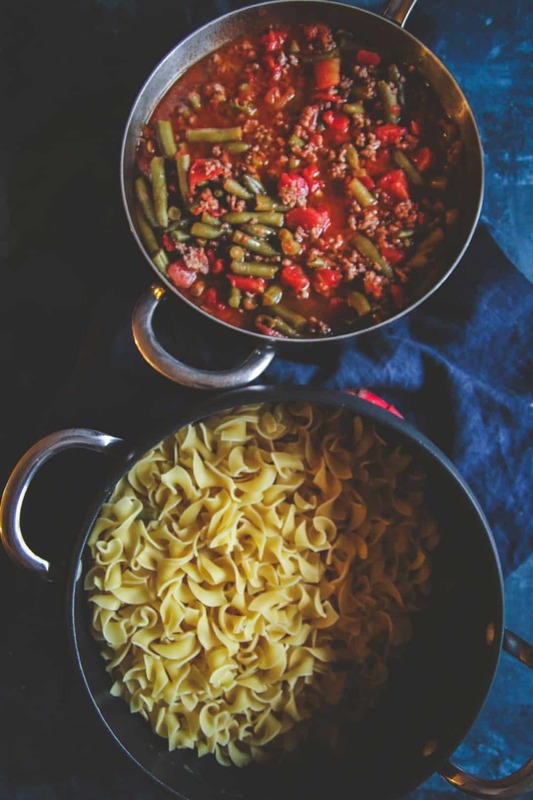 While the noodles cook, in a large pan cook the ground beef, breaking it up as it cooks, until no more pink shows (about 5 minutes). Add in diced tomatoes and green beans and stir. Add in a pinch of salt. 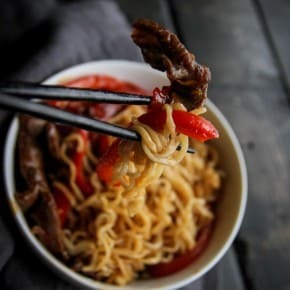 In a large casserole dish add noodles and beef mixture. Sprinkle cheese on top. Bake for 5-10 minutes, until the cheese is melted. Seeing your name and your nice comments always makes my day girl! Thank you! 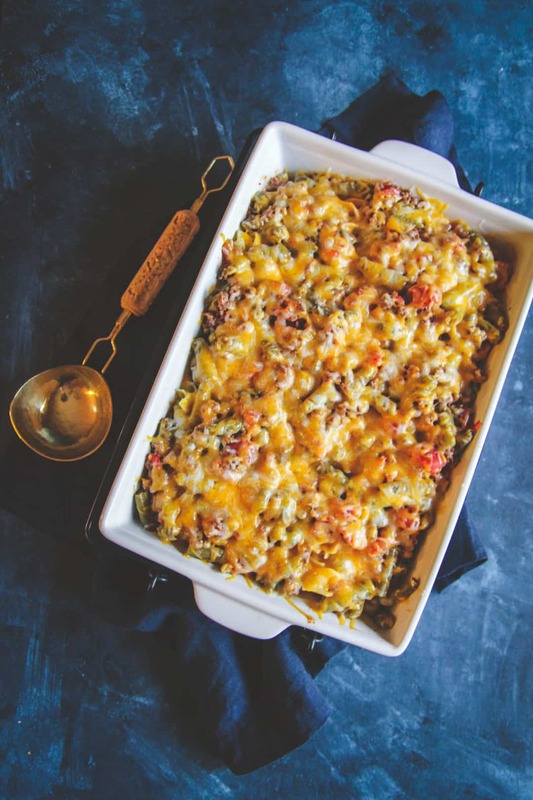 Love a good casserole recipe and this just looks amazing! Can’t wait to try it! Thank you so much, appreciate it, hope you love it! Thank you so much for sharing this recipe, it’s genius! 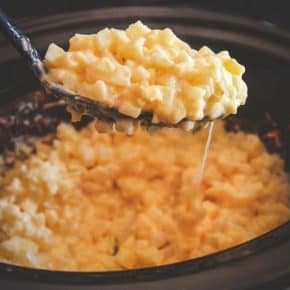 It’s SO GOOD, and I too love that I can have the ingredients on hand! I have made it so many times now. One of my friends said she was so skeptical after I told her about it, then I made it and she had it, and now she said she makes it every week for her family! 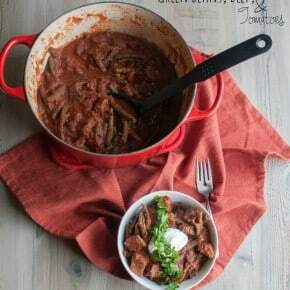 I made this recipe tonight while in a pinch and needing something quick, with ingredients I already had, THIS WAS THAT! I’m a single parent so always searching for quick, relatively “healthy” meals. My 2 & 4 year old FINISHED their bowls! And anyone who has picky kids or kids that just don’t eat know what a big deal that is. THANK YOU!!! I WILL BE MAKING THIS AGAIN!! Oh my goodness Amanda, your lovely comment made my day!!! I totally know what picky kids are like, so I really appreciate that you mentioned that. Thanks again, I’m so happy you and your kids love it! Seems like a lot of noodles and beans and tomatoes and not much beef, this works out?? 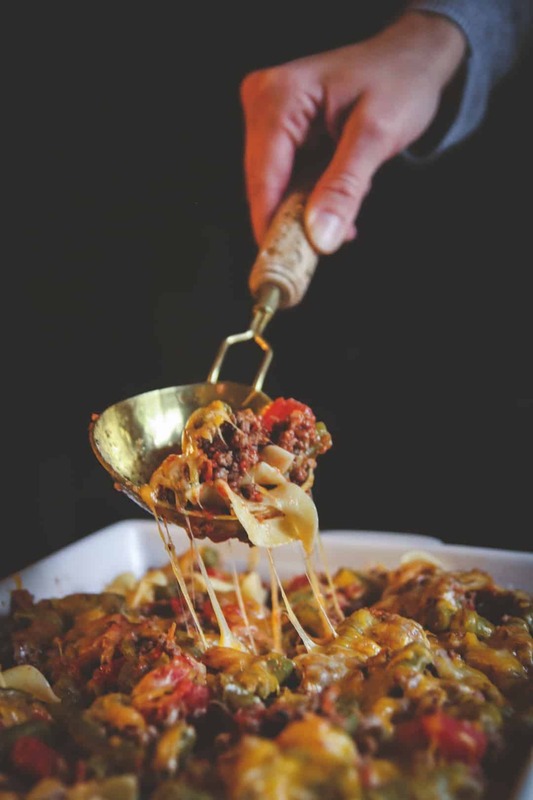 This does work, it’s a casserole type dish, so everything gets mixed together 🙂 But, if you like things more meaty, you could always add more meat! Making this for my son and daughter in law that just had twins! Good comfort good and not spicy for the nursing mom. I added frozen peas instead of green beans and also had some leftover grilled onion and bell peppers that i threw in for a little savory flavor. Thanks for a lovely “to-go” casserole! Thank you so much, that is so nice to hear, I bet they’re going to love it!! Made this for our Bingo Hall and all enjoyed it a lot. Thanks always looking for easy things to make. Turned out ok..kinda bland.. Used to frozen vegetables could tell the difference with the can. Even added cream of mushroom soup. No flavor. Thanks for your feedback – sorry to hear it was a little bland for you – I’m surprised to hear that, people have given this casserole rave reviews. The two things I can think of are- did you use canned tomatoes with italian herbs? Did you salt your pasta water? Sometimes that makes all the difference.